"The Four Moments of Truth," written by Dr. Sam Shriver, is practitioner’s guide to training transfer that connects learning to behavior change, and behavior change to tangible results. JOIN CLS AT ATD 2019 IN WASHINGTON D.C.
Come see us at Booth 1601! From the launch of our new MyCLS platform, the release of our new book on sustainment, “The Four Moments of Truth,” and our workshop sessions, you don’t want to miss a thing! Training Industry announced that The Center for Leadership Studies has been named among its selections for the 2019 Top Training Companies™ lists for the Leadership Training sector of the learning and development market. Read our article in the Leader to Leader 2019 winter issue, "Situational Leadership® and Cybersecurity," by The Center for Leadership Studies' executive vice president, Sam Shriver, and chief operating officer of IronNet Cybersecurity, Brett Williams, Maj Gen USAF (Ret). If it weren’t for change, there would be nowhere near as much emphasis on leadership. This article defines the attributes of Situational Leaders and how they provide the resiliency organizations need to survive in a world that will never stop changing. View The Center for Leadership Studies’ new digital catalog for an overview of our history, product offerings, sustainment and more! 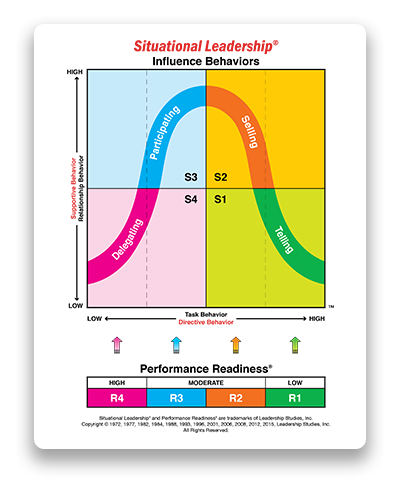 The Situational Leadership® Model is arguably the most recognized, utilized and effective influence tool in the history of the behavioral sciences. Since the 1960s, Situational Leadership® has proven to be a successful framework that allows leaders to match their behaviors to the performance needs of the individual or group that they are attempting to influence.